Recurring revenue streams are the goal of every reseller. The capture of a maintenance contract at the time of sale and the ongoing renewal of the contract provides ongoing contact with the end-user, an installation operating at peak proficiency, and a profit opportunity for you for years to come. NewWave’s Warranty Advantage Program provides a host of on-line tools to simplify the contract attachment and renewal process, and assist our resellers in managing their maintenance business. 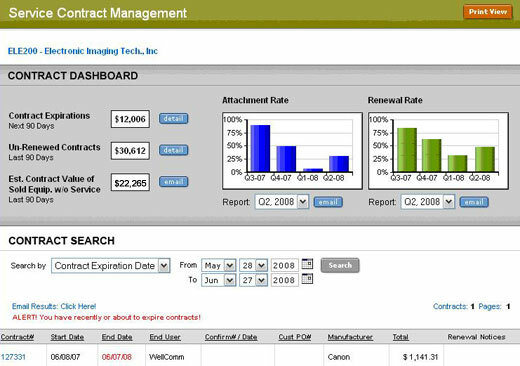 Introducing the new On-Line Service Contract Management Dashboard – a comprehensive service contract management resource center providing complete visibility into your maintenance business. Please Note: This a secure area of the site, you must be authorized to gain access to the full functionality of the Service Contract Dashboard. Please Download and complete the Warranty Advantage form and either email us at bwashington@newwavetech.com or fax it to 301-948-5883. NewWave will notify you via e-mail 60 days and again at 30 days prior to a contract expiration. In addition, these renewal notices are now available online in our Contract Management Resource Center. VAR Notification - a PDF document informing you of a pending contract expiration including all necessary data for contract renewal. Rich Text Notification - Complete with your logo and company contact information - providing a ready communication you can forward to your customer notifying them of a pending contract expiration. Quotation - NewWave provides you a quote on a specific contract and at the same time sets up a quote in our system that can be executed online when you renew the contract. You can search for your contract by a variety of methods and drill down to the actual contract document and details. Identify in real time up-coming service renewal opportunities with detailed contract reporting to assist you in capturing this ever critical recurring revenue stream. end user information, contacts, model numbers and more. Uncover new service sales opportunities by identifying equipment you have sold without service, giving you another chance at attaching a service contract. For Resellers signed up in the Warranty Advantage Program we now provide quarterly contract attachment and contract renewal reports to enable you to assess the ongoing performance of your maintenance business and identify opportunities for revenue growth. These reports are delivered via e-mail as well as being made available online. A new function of NewWavetech.com, individual users will be notified by an alert on their business dashboard upon entering the secure area of the site of contracts that have recently expired and those about to expire. Clicking on the alert icon will bring them to the contract management module with those at risk contracts sorted and presented for review.